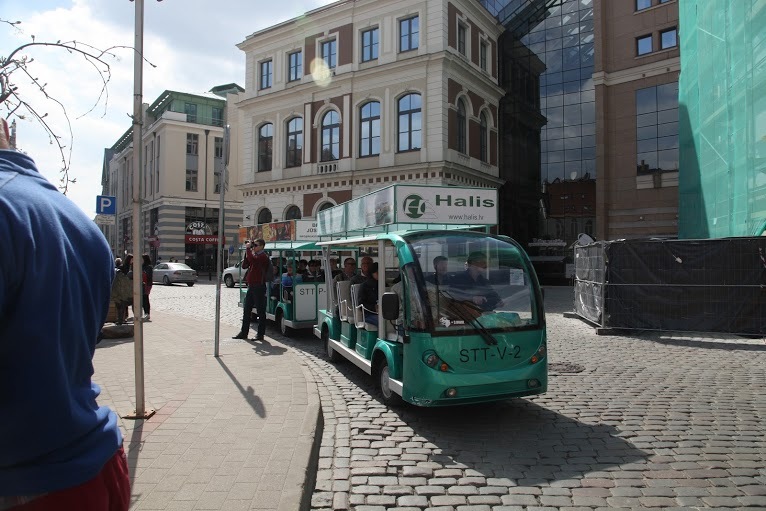 Being in the heart of Riga – in the Old city, you have a unique possibility to look city architecture moving on Electrobus through narrow city streets. It follows a certain route and will present you with most interesting and beautiful old town attractions and its history. During journey there is a possibility to hear the information of history of the Old city in 8 languages – Latvian, English, Russian and etc. The final stop of Electrobus is on the Dome Square. Simultaneously on excursion could go 23 passengers – 11 in the mover, and 12 – on the trailer. Duration of journey is 35 minutes. To Children till 7 years journey is for free, sitting in armful at the adult. In the families arriving at excursion with children till 7 years, parents pay only. Tickets are got at the driver before a trip. Electrobus begins work at working days from 10.00 till 22.00, on Sundays and celebratory days from 12.00 till 22.00. Also there is a possibility to prolong the time. By ordering a group trip it is possible to agree about concrete time of the beginning of travel. It is necessary to notice that tickets operate as well as the coupon of discounts – you receive 10% discount at restaurant Filings. With a discount it is possible to visit restaurant for two times; for this purpose ticket has a peel off coupon.For passenger convenience on a tickets underside is a vehicle route map in Old Town, and there are marked with figures aforementioned restaurants.